Cheese making itself goes back to early man, one of our first ‘processed’ foods. It has been vital to humanity as a way of preserving one of natures most nutritious processed foods for various lengths of time. It also represents various ethnicities, based on their local supplies, and needs based on their environment. Along with Cheese, other dairy products such as yoghurt not only allow for storing dairy, but they also allow for a wide variety of flavors, and also create alternative nutrients due to bacterial processing, enzymys, and additives. For example, yoghurt is often consumable by lactose-intolerant individuals. In an extended emergency situation, lactose intolerance is a very common problem with diet changes, so knowing how to deal with it can literally save a life. 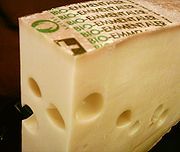 For more information about cheese history, check out this Wikipedia article on Cheese. I would definitely recommend that you have some knowledge of cheese making in your head (practice), but also make sure you have that information on paper. There are several books in our suggested links that contain helpful information on making cheese in your own home. For a great variety of cheese making recipes, please check out Fankhouser’s Cheese Page. This site has an excellent variety of cheeses you can make at home, as well as yogurt, and several other great recipes, from breads to jams. This page is a must read (and watch, videos too), if you are interested in trying your hand at cheese making. Just search youtube for Good Eats Cheese, and you’ll find several episodes in how to use cheese, as well as make it. The cookbook “Natural Meals in Minutes” by Rita Bingham (pages 114-137) has detailed information and recipes on making a variety of cheeses from powdered milk. I have all of Rita’s books and they are amazing resources for those who want to use their food storage now and enjoy it. Rita is the daughter of Ester Dickey, who wrote Passport to Survival. Standing on her mother’s shoulders, Rita has well advanced the use of food storage foods. I would like to thank her for her work with beans also. I love grinding my beans to a powder, and whisking that powder into a little water flavored with bouillion, and having a creamy bean soup in less than three minutes! Delicious. Once I even called Rita and we visited awhile. She sent additional recipes to me. Rita has a strong desire to help others be prepared and to stay healthy.